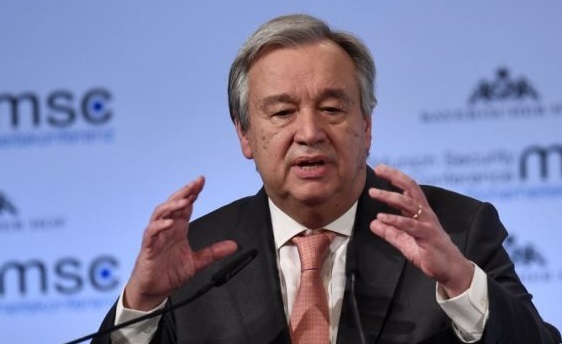 NEW YORK: United Nations Secretary General António Guterres on Saturday strongly condemned the recent terrorist attacks targeting political rallies and candidates in Pakistan. “The secretary general extends his heartfelt condolences to the families of the victims and to the government and people of Pakistan,” read the statement issued by the deputy spokesman of Guterres. It said that UN stood in solidarity with and supported the efforts of the government of Pakistan in the fight against terrorism. In the last seven days, four attacks have targeted election candidates resulting in at least 157 deaths and injuries to over 200 people in Pakistan. On July 7, the convoy of Muttahida Majlis-e-Amal (MMA) candidate Shiren Malik was targeted in Bannu. The attack, which left Shiren Malik and six others injured, was carried using a bomb planted in a motorcycle and detonated remotely. An Awami National Party (ANP) election gathering was the target of the second attack, which was carried out by a suicide bomber in Peshawar on July 10. Among the 22 martyred was ANP leader Barrister Haroon Bilour, who was the party’s candidate on PK-78. On the morning of July 13, Jamiat Ulema-e-Islam-Fazal (JUI-F) leader Akram Khan Durrani’s convoy was targeted as it headed back from an election rally in Bannu. Durrani, who is contesting NA-35 from the MMA ticket, survived but four others were martyred. The fourth and bloodiest attack took place in Mastung, hours after the Bannu attack on July 13. The suicide attack targeted Balochistan Awami Party (BNP) provincial assembly candidate Nawabzada Siraj Raisani. At least 131 people along with Raisani, who were present at the election rally, lost their lives. Raisani, whose brother Aslam was a former chief minister of Balochsitan, had also lost his 14-year-old son in a suicide attack back in 2011 in Mastung.